Arturo O’Farrill, pianist, composer and educator received his third Grammy Award in 2015. 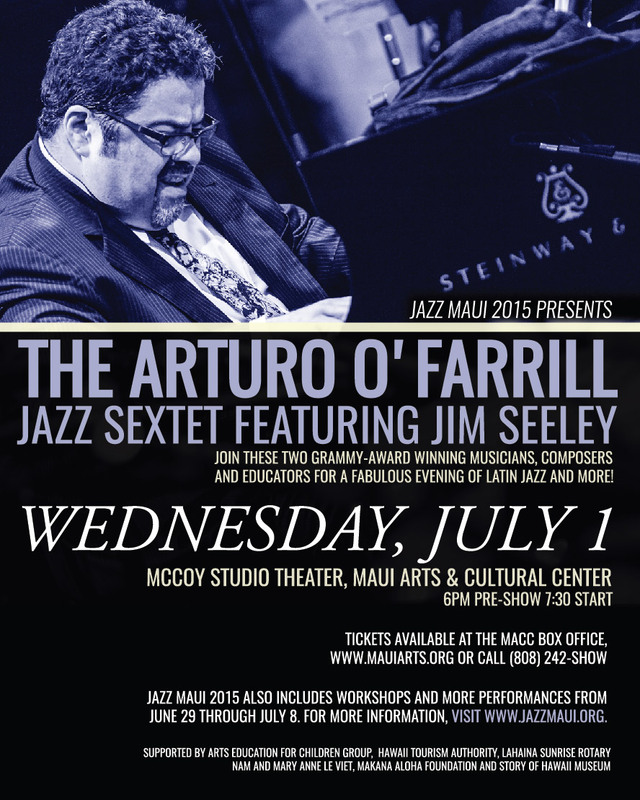 When it comes to Latin jazz, Arturo O’Farrill ranks as the modern king of the genre. Trumpeter Jim Seeley has performed with Ray Charles, the Duke Ellington Orchestra, and Maynard Ferguson, and has been a long standing member and featured soloist with the Chico O’Farrill Afro Cuban Jazz Orchestra. The University of Texas Arlington faculty jazz sextet will open the show. There is a pre show courtyard performance by Na Ali`i Big Band (students from King Kekaulike HS on Maui). Tickets: $35, $45; Sponsored by the Arts Education for Children Group, Hawaii Tourism Authority, and Makana Aloha Foundation with artist booking by Dancin Dave Productions; Master class workshops during the day of the concert require a separate ticket for entry. $20. The UT Arlington Department of Music is an accredited member of the National Association of Schools of Music (NASM) with a world-renowned faculty and approximately 325 graduate and undergraduate students. It offers both undergraduate and graduate degrees in jazz performance. The Bachelor of Music in Jazz Studies degree is a robust music degree combined with significant coursework in jazz studies. The Bachelor of Music in Jazz Studies is designed to prepare students for professional work in the ever-growing jazz and commercial music areas or for successful audition into graduate school. Beginning, intermediate and advanced classes with internationally renowned professionals.